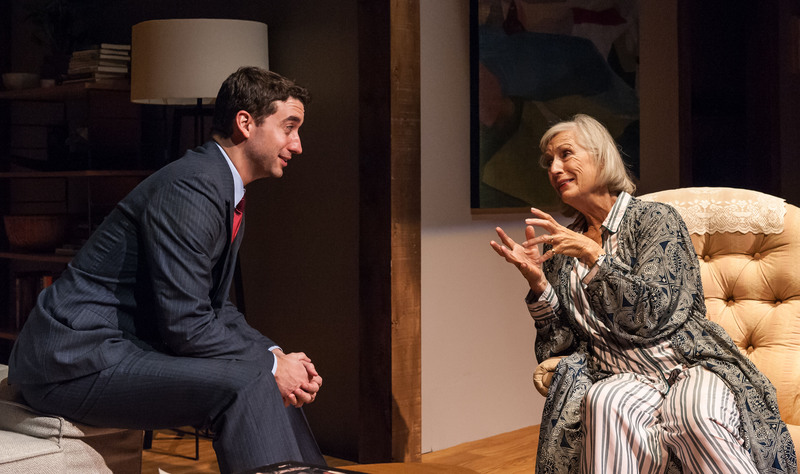 Alejandro Simoes & Sarah deLima in MARJORIE PRIME. Photo: A.R. Sinclair Photography. CAMBRIDGE – Loneliness is a terrible thing. We humans are social animals who crave touch and feel and companionship. When that loved one is taken away, it also takes away a part of us – including our shared memories. What if we could find a way to keep that loved one present in our life in some form or fashion after his/her death? Would you want that? And what form would that take? Playwright Jordan Harrison speculates about what might happen in the “not too distant future” in his Pulitzer Prize finalist play “Marjorie Prime,” now being performed by the Nora Theatre Company through Oct. 9 at the Central Square Theater. Harrison’s take on artificial intelligence taking human form fits in perfectly with Central Square’s Catalyst Collaborative @ MIT series, which has produced a series of productions – several of which were award-winning – with scientific themes. Add to that list Nora’s taut, tense production of Harrison’s intriguing play. Marjorie Harrison (Sarah deLima ), 85, has been a widow for 10 years after the death of her husband Walter. But as the play opens, seated across from her is a attentive, well-dressed young man also named Walter (Alejabndro Simoes). They discuss shared experiences. This Walter is actually a Prime, a computer-generated holographic image that speaks. It has a physical presence of sorts and is – pardon the expression – a dead ringer for the long-deceased Walter, But, as with any computer, he’s only as good as the information coming in. There are obvious gaps in what he – OK, it – knows and can discuss with Marjorie’s cognitive abilities declining. At one point, Marjorie tells a story but Walter can’t “recall” it. “I’m afraid I don’t have that information,” it replies. Walter encourages her to discuss the incident so they can share it at a future time. There are stories about a tennis pro who wooed Marjorie, but distinguishing what was fact from fiction in her life becomes increasingly difficult. But there is a major gap in Marjorie’s memory that has to do with a loved one, a tragic incident that colors all that goes on afterwards and is referred to in hushed tones by Marjorie’s daughter Tess (an excellent Lee Mikeska Gardener, Nora artistic director) and her husband Jon (Barlow Adamson), a decent, supportive sort. Both are are frequent visitors to Marjorie’s home. Alas, Tess has problems of her own and Jon is betwixt and between, worrying about just how far he has the right to intrude in a mother-daughter situation that is complicated by the presence of a non-human third party (Walter Prime). To reveal more about the plot gives away too much, although the play’s title is an obvious clue to future events. DeLima, a two-time IRNE nominee in recent seasons and a 2014 winner, is enjoying a lengthy, distinguished career that continues unabated with another fine performance, while Simoes skillfully walks a tightrope as the Prime ,working within the very narrow parameters of the role. Arshan Gailus’ original music and sound design add to the atmosphere and the tension of the piece. Director M. Bevin O’Gara adds this fine production to a burgeoning resume that includes “Milk Like Sugar” at the Huntington last season and, before that, the award-winning “Tribes” at the SpeakEasy. The Nora Theatre Company production of Jordan Harrison’s “Marjorie Prime.” Directed by M. Bevin O’Gara. A Catalyst Collaborative@MIT Production. At Central Square Theater, Cambridge, through Oct. 9. centralsquaretheater.org.